So Jay Rayner appears at Hay. His audience of 500 people had paid £7 per ticket and he was given a flower in payment. I absolutely and completely accept that this is not ok. And I admire Philip Pullman for resigning as patron the Oxford Literary Festival on the grounds that the festival doesn’t pay its authors, which is in conflict with the position of The Society of Authors, of which he is president. So if I’m offered the chance to appear at a festival, it’s a joy. Writing is my work now. If it’s going to stay that way, I need all the opportunities I can get. And so, whilst my head knows that my time is valuable and that I should be paid, my heart is grateful to the festivals that have welcomed me, either on my own or as part of a panel. They haven’t been the big festivals; they’ve been organized on a shoestring by people who love books, working tirelessly alongside their own paid work, family commitments and other responsibilities – exactly how I got my novel written in the first place. So while these very necessary discussions are happening, I’m torn. I’m grateful to the high profile authors who have the clout to raise the issue and are using it to defend the rights of authors everywhere. But I’m also heart-glad for the chances I’ve been given to meet and talk to readers, by people who simply couldn’t have asked me if I’d had to be paid. 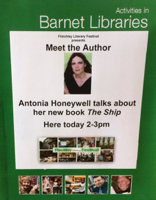 As one of the organisers of the Finchley Literary Festival where you very kindly appeared, we were truly thankful. You gave a *star* performance. And you are right, that for small festivals like ours where everybody gives up their time, willingly, but without funding, it is difficult to pay authors. However, our hope is that we can at least make new authors feel welcome and reinforce just how special they are and hopefully sell a few books. Plus give them the experience of what it is like to be part of a small festival for their future experience.